New York City Department of Environmental Protection (DEP) Commissioner Vincent Sapienza today joined Council Member James Van Bramer, leading New York City environmental groups including the Newtown Creek Alliance, Riverkeeper and Stormwater Infrastructure Matters (SWIM), and educators and students from LaGuardia Community College to celebrate the installation of tidal wetlands in Newtown Creek at Dutch Kills. The wetlands will help to improve water quality, provide habitat for wildlife and a more natural aesthetic area for the community. This is the first time Newtown Creek has had substantial wetlands in more than 100 years. Through this project, the Dutch Kills western terminus site has received placement of 1,400 cubic yards of sand to establish proper elevations to support the growth of 1,455 square feet of Spartina alterniflora plugs. 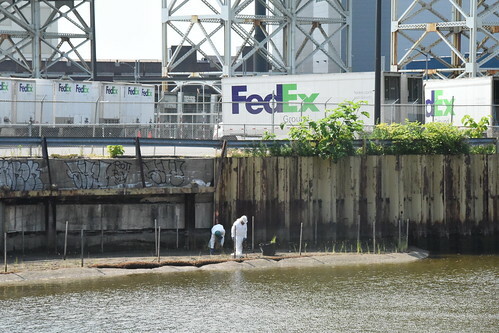 The scope of work for a 2015 pilot study in Dutch Kills previously consisted of the placement of 500 cubic yards of sand in a 0.09 acre area along the bulkhead. At the Hunters Point Avenue Bridge, 3,300 cubic yards of sand have been added on the bridge’s western and eastern sides to establish the proper elevations to support the growth of 6,900 square feet of Spartina alterniflora plugs. Wetlands, which are transitional lands between aquatic and terrestrial ecosystems, provide a wide variety of beneficial functions. They attenuate flooding, help maintain stream flow, improve water quality, absorb nutrients and carbon, and provide plant and wildlife habitat. Nearly half the nation’s threatened and endangered species rely on wetlands to survive. Attention has recently been focused on the ability of wetlands to sequester pathogens, improve water quality, and reduce nutrient levels. With this ability, natural and constructed wetlands have been widely utilized for water quality enhancement. The flooding and ebbing of tidal waters through a wetland can increase the mortality, and subsequently decrease pathogens by sequestering them within the marsh sediments and increasing their exposure to harmful Ultraviolet light. The presence of vegetation within wetlands provides a source of oxygen into surface waters to help improve water quality within coastal ecosystems. Dissolved Oxygen improvements can be attributed to both the roots and the stems of wetland plants. The Newtown Creek waterbody and watershed includes Newtown Creek, Dutch Kills, Maspeth Creek, East Branch and English Kills waterbodies and defines the border between Brooklyn and Queens. Newtown Creek is a tributary to the East River, and was originally a stream draining the uplands of western Long Island. Urbanization and heavy shipping traffic significantly modified the course and channel of Newtown Creek over the years, most notably filling the inland streams, and widening and deepening the downstream end. By the mid-1800s, the creek was one of the busiest industrial areas in the world, crowded with ships importing raw materials and fuel and exporting oil, chemicals and metals. More than 50 industrial businesses lined its banks including oil refineries, petrochemical plants, fertilizer and glue factories, sawmills, and lumber and coal yards. In 1967 New York City constructed the Newtown Creek Wastewater Treatment Plant to treat sanitary sewage during dry weather and to capture a portion of the combined sewage and storm flow generated during wet weather. Over the last several years, the City has invested nearly $260 million in capital projects to improve water quality in Newtown Creek. In addition, the NYS Department of Environmental Conservation recently approved the City’s Long Term Control Plan for Newtown Creek that provides for an additional $1.4 billion investment to reduce the volume of combined sewer overflows to Newtown Creek during wet weather. Thanks to these projects and the efforts of many advocacy groups including the Newtown Creek Alliance, Riverkeeper, and the SWIM Coalition, life has slowly started to return to the Creek, as evident by the current prevalence of blue crab, fish, and waterfowl.